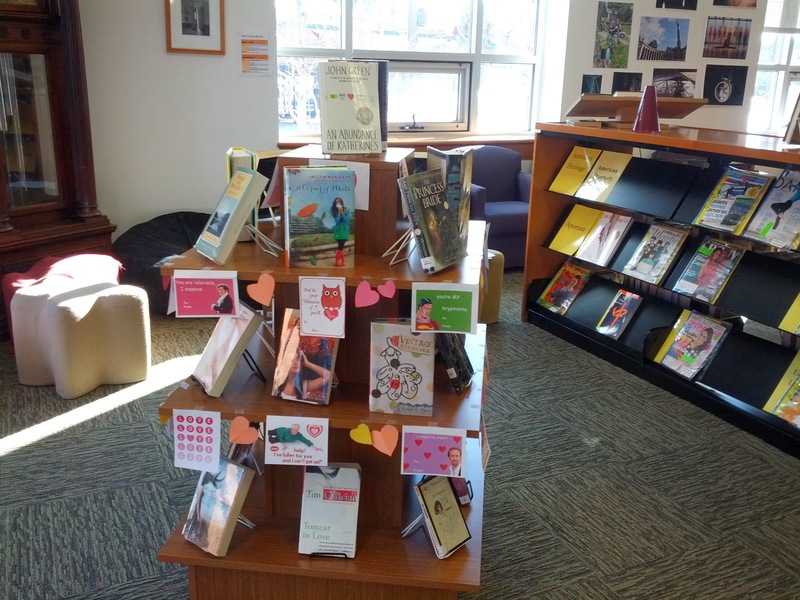 For February I pulled all of the books with a strong romantic element that I could find in our fiction stacks (fortunately we have a lot!). Then I searched the net for the most playful, groan-inducing pun-filled Valentine’s Day cards I could find, bonus points if they referenced some sort of nerdy tv show or book (think Dr. Who, Lord of the Rings, Star Wars, Mine Craft, Sherlock, Downton Abbey, etc. Just search funny valentines and a whole bunch will come up on Google Image Search). Of course everything had to be kept PG. 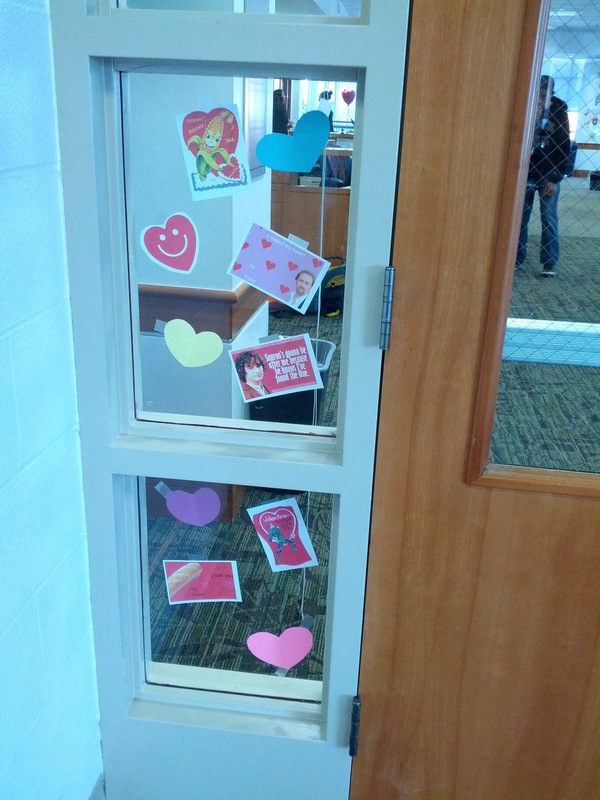 I printed them out, cut out some paper hearts and plastered the walls, windows, circulation desk, study carrels, basically any open surface with V-Day goodness. The kids have really enjoyed it so far, I see a lot of them showing their friends their favorites. The in-your-face cards are the most important piece in my plan to bring the kids into the library, and then hopefully to the books. As for the books themselves, I wanted to make sure I had a lot of different genres represented. In the email I sent school-wide I divided them into 3 general categories: Contemporary slice-of-life YA, fantasy action and adventure, and historical/literary fiction. The full list of titles featured is at the end of this post. And speaking of the email, I sent 2 test emails to personal accounts that I could check on my smartphone because that is how the majority of our students read their school email. My first draft was a nice table with lots of images at the top and a long descriptive paragraph. It looked great on my laptop, but it was way too long on the phone. I cut a bunch of the verbiage and reduced the number of pictures and all-around simplified the entire thing to get straight to the point. Yes, it is less pretty than my original draft, but when your priority is getting teens’ attention for long enough to get your message across, the quicker you can get to the main point, the better. In order to maximize all opportunities for grabbing the kids’ attention, I created a virtual bookshelf on our OPAC. I’m not sure how much eye traffic it will get, but since it was easy to do, I felt it was worth doing. 4. Cross-promote with any other applicable website/app possible. The more times you can hit your users with your message, the greater your chance of successful outreach!